There’s nothing like a sunny June morning for a motorcycle ride, especially if you’re heading out for breakfast. Minnesota has many little small-town cafes where you can get a plateful of soul-satisfying goodness for a nominal amount of money. Hunting for breakfast can be a sport in itself! Ralph must have been hungry, because he didn’t dawdle on a backroad leaving town, but headed straight up 35W. He fooled me when he took the Taylor’s Falls (US 8) exit. I thought maybe we were going to the Chisago House, where the great 19th century orator, Stephen Douglas (you know, the guy who debated Abe Lincoln), once visited. However, he turned north on Old US 61, and I knew were were going to Harris, Minnesota, about half-way between the Twin Cities and Duluth. After an hour of riding, we were ready for breakfast. 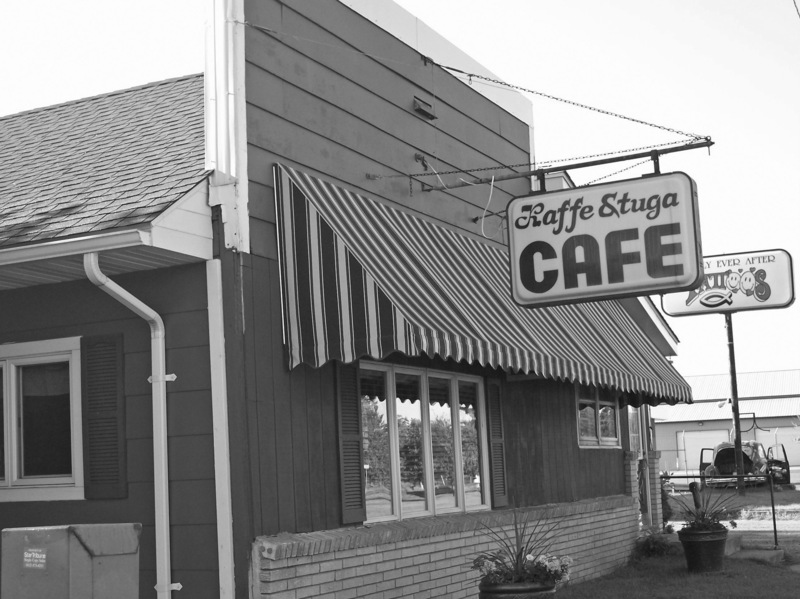 Church bells were ringing out old hymns as we dismounted and walked to the Kaffe Stuga, which mixes knotty pine paneling with traditional Swedish decor and generous portions of homestyle cooking. I ordered my favorite, the apple fritter French toast with ham. This isn’t a skinny little shaving of deli ham, it’s a slab. A meal in itself. I noticed a woman at the next table nibbling on the Stuga’s version of an egg McMuffin, and that looked mighty good, too. The service was quick, but no one pushed us to leave. Ralph had a second cup of coffee, then we strolled out the door and back to the bike. The antique store next door was closed, as were most of the businesses in town. We continued north on 61 to Rush City and took a left on 4th St. We came upon the “world’s largest walleye” just before we crossed I 35. Supposedly caught by Paul Bunyan, its much smaller than the walleye statues in Isle and Garrison. We drove out into the country. I soon smelled water. The road wrapped itself, snake-like, around the curvy shores of Rush Lake. There is a huge old farm house standing where Rush Lake Road/Rush Lake Trail/Greeley Road tees with MN 70. Its paint is weathered, cracked and peeling. A newer home stands nearby. I wondered why the farmer left the old house standing. It seemed like he didn’t love it enough to take care of it or pull it down. We followed a zig-zag southwesterly course through Mora and Ogilvie until we hit MN 47, where we turned south for home. Our hunger and our wanderlust were satisfied for another day. Posted on June 5, 2017, in Minnesota, Motorcycles. Bookmark the permalink. Leave a comment.